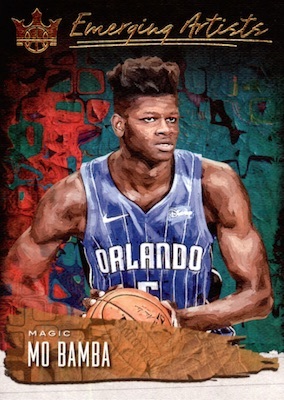 There is still nothing like Court Kings from a design perspective and that does not change with 2018-19 Panini Court Kings Basketball. One thing that does change, however, is the Hobby box output. 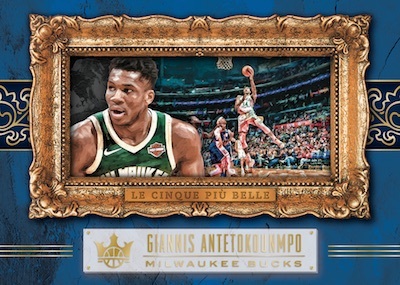 Instead of one autograph and one relic like 2017-18 boxes had, collectors can now look forward to two autographs per box. 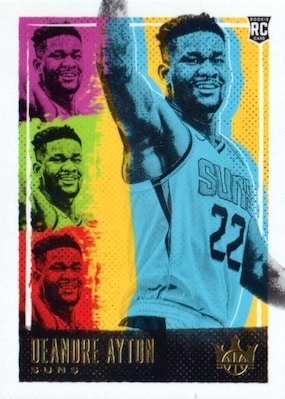 A mashup of abstract art, modern styles, graffiti designs, and maybe even a little Andy Warhol homage, 2018-19 Panini Court Kings Basketball is anything but dull. 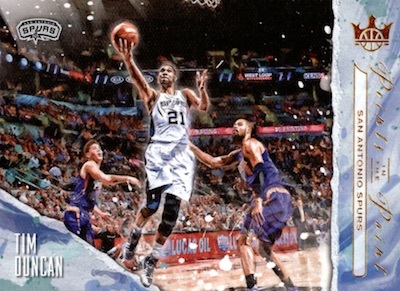 The base set includes a rookie lineup that boasts four different designs per player. 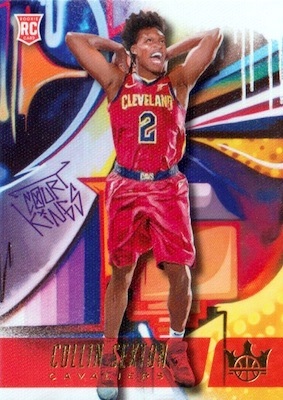 Increasing in rarity at each level, Rookies I cards are the most common and Rookies IV cards are the rarest. The RCs all combine to average two per box. 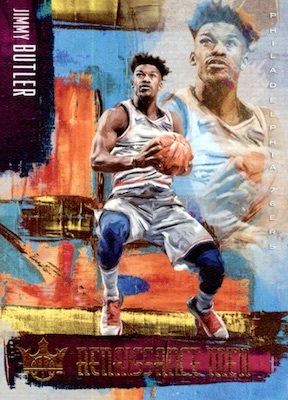 Inserts also come two per box in 2018-19 Panini Court Kings Basketball. In addition to the more common choices, short prints include Aurora, Gallery of Stars and Le Cinque Piu Belle. These SSP insert lines average less than one per case combined. 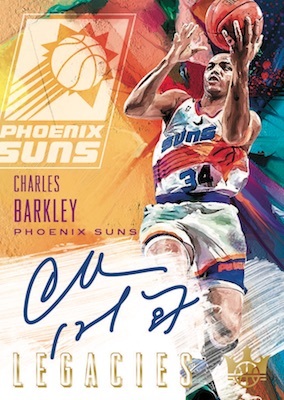 As with most NBA releases, the 2018-19 Panini Court Kings Basketball checklist is still largely geared to the autographs. 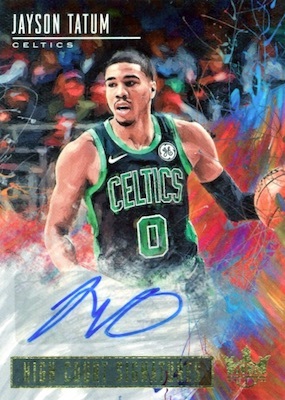 If you are chasing top rookie signatures, the on-card Fresh Paint and Heir Apparent cards are a key option. 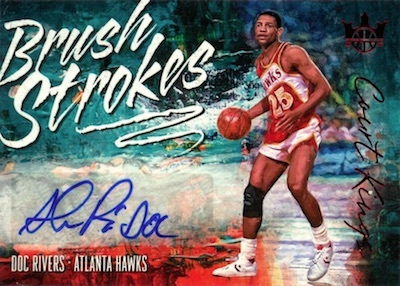 Also hard-signed, the Legacies Signatures line is home to some of the best NBA players in history. 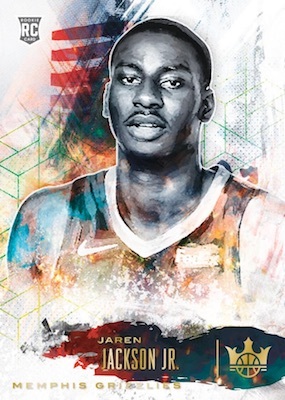 All the on-card autographs in 2018-19 Panini Court Kings Basketball are numbered to 199 or less. Limited parallels include Sapphire (#/25 or less) and Masterpiece (1/1). 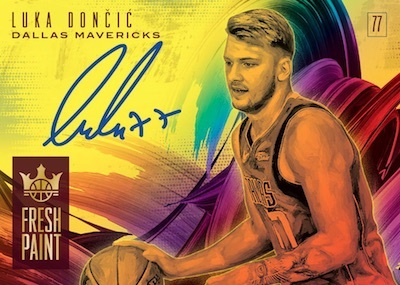 Luka Doncic 2018-19 COURT KINGS HEIR APPARENT RC AUTO 022 199! 🔥 MAVS! MINT! PARALLEL CARDS: International, Jade, Ruby #/99, Sapphire #/25, Masterpiece 1/1. 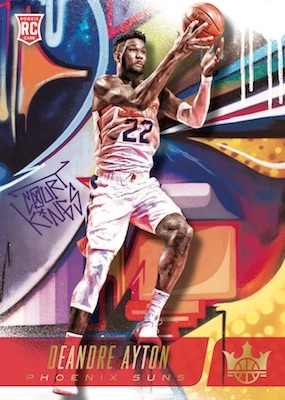 View available 2018-19 Court Kings NBA autographs on eBay. 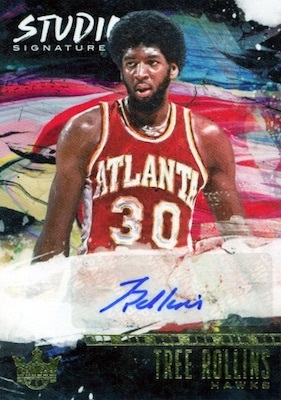 PARALLEL CARDS: Ruby #/99 or less, Sapphire #/25 or less, Masterpiece 1/1. PARALLEL CARDS: Jade, Ruby #/99 or #/49, Sapphire #/25, Masterpiece 1/1. 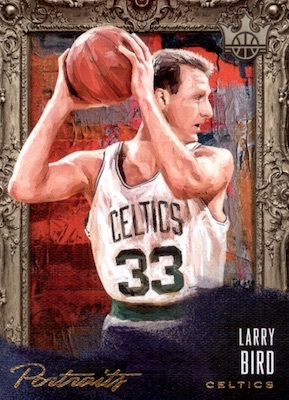 PARALLEL CARDS: Jade, Ruby #/99 or #/49, Sapphire #/25, Masterpiece 1/1 (No Gary Trent*). 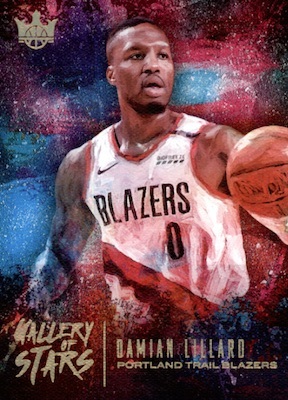 PARALLEL CARDS: Ruby #/99 or less, Sapphire #/25 or #/10, Masterpiece 1/1. PARALLEL CARDS: Ruby #/35 or #/25, Sapphire #/25 or #/10, Masterpiece 1/1. PARALLEL CARDS: Ruby #/99, Sapphire #/25, Masterpiece 1/1. PARALLEL CARDS: Ruby #/99, Jade #/35, Sapphire #/25, Masterpiece 1/1. View the 2018-19 Court Kings Basketball checklist Excel spreadsheet. Do you have any idea how much will it be? It should be around $100 a box. Did they get rid of box toppers? If so i’m glad. I don’t know how to store em. There was no mention of toppers in the initial sales info this year. 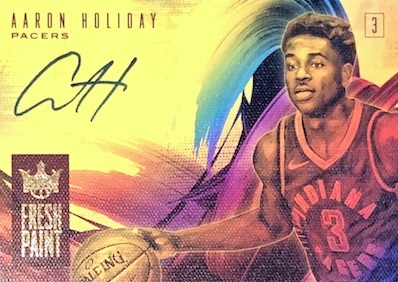 Trey, has there been any information released about the Aurora inserts? At our local one guy said they were a case hit and another said they were an unannounced 1/1. 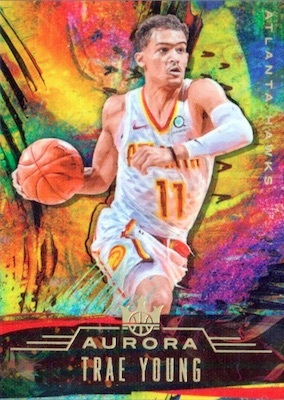 Curious I pulled the Aurora Ben Simmons and wondered just how rare the card might be? 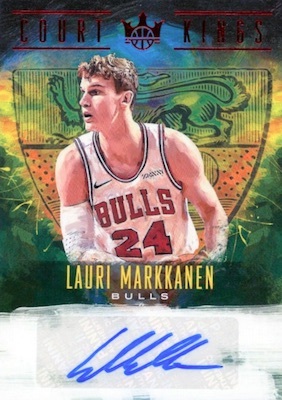 Per Panini, “Aurora, Le Cinque Pui Belle, and Gallery of Stars COMBINE to fall even fewer than one per case.” That was provided on the initial sales info and repeated by Panini in other posts. 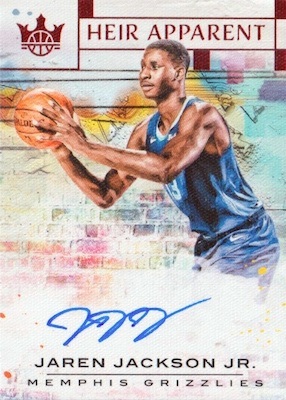 Definitely not a 1/1 based on what I have seen but no Simmons versions have reached eBay yet. Trey, thanks for the help. You do an amazing job in helping us collectors keep up with everything! Bought a case of this and find that this product is just below average. Here is why? 2. Collation – for base (got 4 Oladipos and 4 Joe Ingles in the case. Why not make more of Superstars rather than non-all stars) Cant even remember if I got any Curry, Durant or Giannis base at all. Autos are actually poorly collated. Since I saw some great case and below average case. In my case, not that great at all. 3. Autos – sticker autos are horrible. Especially for Veteran autos. Making this product weaker. The only fantastic to collect from this set is the Heir Apprarent. Unfortunately I got redemptions for most of them (got 6 in this case). Overall: below average. Plus points is the low price point of $100 per box. 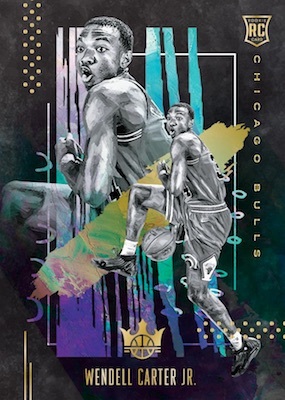 But the value of the money is so low this product reminds you of Fleer 90s that are lower tiered product. This could be pegged slightly above Hoops in terms of the Hierarchy of this product. 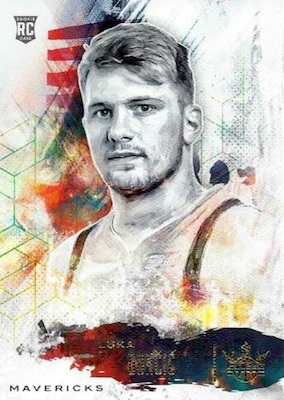 I bought a case of this and hoping to land one Luka RC base card. 10 cards per box and with 16 boxes, I have high hopes to get at least one RC with 160 card chances. Alas not a single Luka in sight, this shows how horrible Panini is doing with their collation. 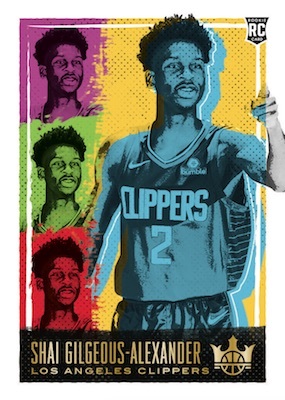 Since Luka was not around, I was hoping to land a single Trae Young and alas he also is absent on my entire case. Who did I get in my entire case? Lots of Jevon Carter, Khryi Thomas, Bruce Brown and other non-notable Rookies. Less sticker autos, less veteran autos unless they are HOF or current All Star or from a championship team. Ensure each case contain good amount of notable RC. Why not seed at least one per case.